Runaway String Band is "an impressive ensemble of awesome musicians with a foot tapping, irresistible sound,” say the Tidewater Friends of Folk Music. With lush vocal harmonies and hot instrumentals, the band provides their audiences with a taste of traditional and popular American music. They perform in concerts and festivals around Virginia as well as private events such as weddings and parties, combining mandolin, guitar, 5-string banjo with the 7-string viola da gamba, a family member of the upright bass with a tender, haunting sound. String band music has long been a staple of the American musical scene. Early groups like Charlie Poole and His North Carolina Ramblers, and Gid Tanner and His Skillet Lickers blended together old tunes and songs with contemporary pieces into a unique and wonderful sound that delighted the ears of their listeners. Doug Austin, mandolin and voice, is a former member of the acclaimed bluegrass ensemble Virginia Rail, a founding member of acoustic jamband Soy Hero and also performs with Tin Can Fish Band. 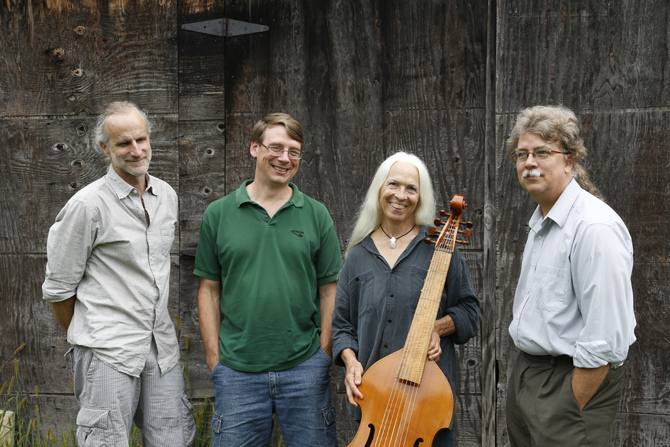 Barry Trott, guitar and voice, toured for 15 years with the early music trio The Virginia Company and is also a long time performer of 17th and 18th century music. Dave Paddock, five-string banjo and voice, brings years of vocal experience to the group, have performed in a variety of vocal ensembles including the Old Dominion Line barbershop quartet. Lynn Trott, viola da gamba and voice, has been a member of several traditional and early music groups and is a lead vocalist in the 19th century band Southern Horizon. For years she has performed early popular music in the taverns of historic Williamsburg.